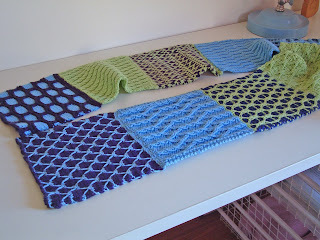 I haven't been working much on the Learn to Knit Afghan. I guess other projects have been more compelling lately. But I did sew the first column together and loved the results. Here is a photo. The panel is too long to photograph as one strip, so it is folded over. At first, I was a little shocked by the color combination, but now I think it looks modern and fresh. I put it around my neck and sort of wished for a scarf like it. I am following Barbara Walker's outline for the order of the squares. Her design distributes the colors and color combinations well and makes a pattern with the diagonals. That is just the sort of thing I don't like to figure out for myself. Here is the last square I finished. I'm still working on the twisted stitch chapter. Currently I'm doing a bias stripe that is simple, but a little tiresome. I think I'll go and try to finish it tonight. Great eye-popping squares! My first thought when that photo popped up on screen was: "What a cute scarf!" 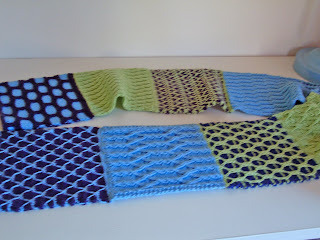 Now I see what it is, and I think it will make a lovely afghan, much better than a scarf. The colors are wonderful, and your photos are quite nice.